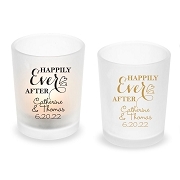 Add lasting sparkle to your day with these Choice Crystal Collection Diamond Candle Holder Favors. Some favors just shine! 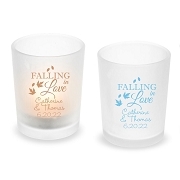 This one certainly does and your guests are sure to make great use of it long after your event is through. 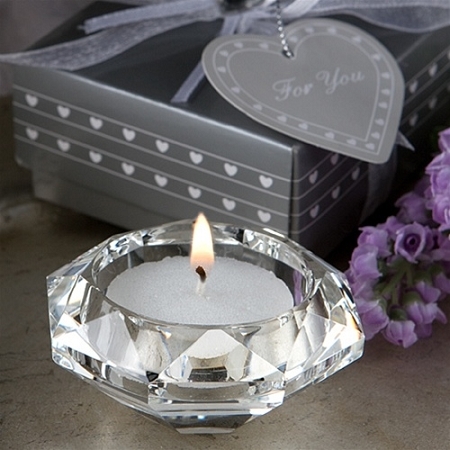 Each exclusive Choice Crystal collection candle favor measures 2.25"round x 1" tall with a glistening diamond shaped multifaceted crystal glass votive candle holder that tapers at its base to form a diamond hexagon shape for a dramatic and brilliant silhouette, nestling an included white tea light candle. An appealing choice for any special occasion, each crystal candle holder favor makes for a stunning presentation nestled in white satin inside a Choice Crystal signature two piece silver box with a heart design, wrapped with a white organza and satin bow with a crystal heart accent on top and an attached silver heart shaped Thank You tag. 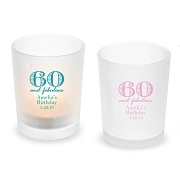 Wedding or shower favor - sparkling tealight holders can also be used to add ambience to guest tables at reception.